The Lunar Chronicles is Marissa Meyer's best-selling, YA science fiction series. Each book within the series retells a classic fairy tale: Cinder is "Cinderella," Scarlet is "Little Red Riding Hood," Cress is "Rapunzel," and Winter is "Snow White." In addition to the four major installments, Meyer added Fairest (#3.5), a story of the coming-of-age of the evil Queen Levana (the Queen from "Snow White"), and Stars Above (#4.5), a concluding set of stories that provide a look into the characters' futures. Once you suspend disbelief and embrace the sci-fi/fairy tale set-up, the story is entertaining. [3 stars] The main protagonist of both this installment and the entire series is Linh Cinder, a mechanic cyborg who operates a stall in a street market in New Beijing. Cinder lives with her cruel stepmother, Linh Adri, and stepsisters, Linh Pearl and Linh Peony; Cinder's father died from the plague. I like the immediate cultural and racial diversity Meyer brings to her fairy tale world. One day while working, Cinder meets Prince Kai who comes to her stall for help fixing his android. Cinder hides her cyborg features (a metal foot and hand) while helping the handsome prince. Thus begins their fairy-tale encounter with a plague and intergalactic war thrown in the mix. The writing in the novel is a bit uneven, but it has a great ending. Full review here. [3 stars] This is the second book in the Lunar Chronicles series, but I actually read it first while on the library waiting list for Cinder. Unlike Cinder which took place in New Beijing, Scarlet is set in Rieux, France. Scarlet Benoit lives with her grandmother on their family farm. Upon Michelle Benoit's disappearance, Scarlet sets out to find her grandmother and the truth regarding Michelle's past as a European Air Force pilot. During her search, she meets Ze'ev "Wolf" Kesley, a street fighter who saves her from a violent confrontation after she voices her support for the infamous cyborg, Linh Cinder, who is in fact the missing Lunar Princess Selene on the run trying to overthrow the Queen Levana. Scarlet later joins forces with Cinder as the war continues. Full review here. [3 stars] I've written this many times, but I am not a fan of damsels in distress. I am a fan of strong female protagonists. Consequently, sixteen-year-old Cress Moon wasn't my favorite heroine but the collective cast's strength helped. The book starts with Cress's imprisonment on a satellite where she works as a hacker of sorts. When Cinder and company cross paths with the satellite, they free Cress only to end up separated from one another. Cress finds herself shipwrecked in the desert with fellow escapee Carswell Thorne who is (temporarily) blind. Needless to say, she swoons and depends upon him for everything during their flight to safety. That aside, there are some great cliffhangers throughout the series and the ending of Cress is really engaging as we get a short glimpse of Princess Winter (Snow White) gone mad. [4 stars] Fairest is a 220-page companion book that tells the life story of evil Queen Levana (also known as the queen from Snow White). It's so good! Undoubtedly my favorite story in the entire series. Levana is seriously cray-cray and I loved every second of her cruel and conniving ascent to power. [3.5 stars] Princess Winter (aka Snow White) is beloved by all Lunar citizens, in part because of the striking contrast she is to her stepmother, Queen Levana. The abuse and trauma Winter has survived, however, has left her mentally unstable. She suffers flashbacks, dissociates from reality, and this often results in her dependency upon her childhood friend, a palace guard named Jacin. The entire cast joins forces to fight the revolution and save Lunar. Winter is a satisfying conclusion to the series, though quite long (832 pages). The Little Android: A retelling of "The Little Mermaid." Glitches: A prequel to Cinder. The Queen’s Army: A prequel to Scarlet. Carswell’s Guide to Being Lucky: A tale of teenaged Carswell Thorne. The Keeper: A prequel to the entire series explaining Scarlet and Cinder's childhood. After Sunshine Passes By: A prequel to Cress. The Princess and the Guard: A prequel to Winter. The Mechanic: A prequel to Cinder. Something Old, Something New: An epilogue to Winter. 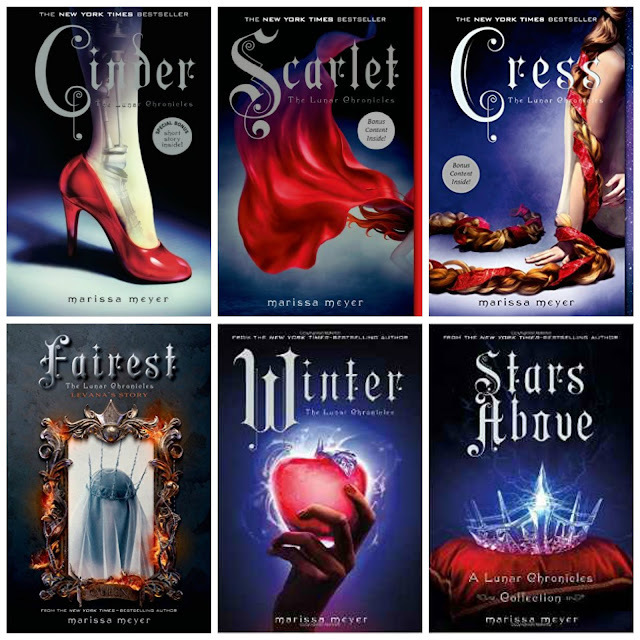 If you like young adult novels and fairy tales, I definitely recommend the series. If you're not a regular science-fiction reader, it can take some time to adjust to the Lunar world, but it's an interesting ride. As with The Selection series, a coloring book of Meyer's series is now available. I'll also note that I just read Marissa Meyer's most recent YA novel, Heartless, a retelling of the Queen of Hearts from Alice's Adventures in Wonderland, and I LOVED IT! A full review is forthcoming, but seriously, check it out!